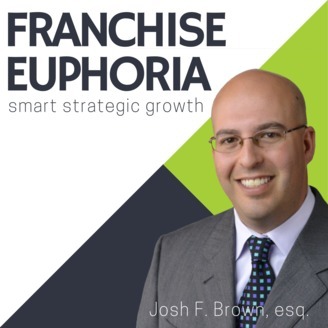 Josh Brown, an Indiana-based franchise attorney and entrepreneur, shares his insights, strategies, frameworks and best practices gained through more than 15 years of work within the franchise world. He helps entrepreneurs and business owners start, grow and build profitable businesses. 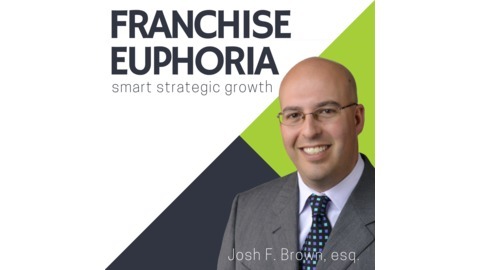 In the Franchise Euphoria Podcast, you'll discover how to design the right business plan for you and your business, avoid the most common and costly mistakes, manage growth and achieve your business goals and dreams. You will hear from leading franchise and business experts like John Lee Dumas, Michael Gerber, Joel Libava, and Dan Miller. Josh's approach to business and the franchise world is honest, real and authentic. You'll have access to content and information that is straight to the point. His work has allowed him to help franchisors and franchisees, entrepreneurs and business owners all over the United States implement successful strategies and build profitable businesses. It was a trip across the world that sparked an idea that would soon become an NYC restaurant staple. Little did Danny Hodak know as he packed up his suitcase and boarded the plan to visit his wife’s native state of Israel that his life would change forever. As a self-proclaimed foodie, Hodak was overwhelmed by the quality of the cultural cuisine. It was while he was sitting in a restaurant in Palestine watching long boards filled with dough slide into a massive wood-fired oven and transform into perfect, fluffy breads that was then served straight from the Taboon to table, that he knew it was an experience and taste he needed to bring back home. [0:59] Josh introduces today’s guest, Danny Hodak. The creator of the middle-teranean franchise concept Taboonette which is based off of his original restaurant, Taboon, located in New York City. [2:36] Josh welcomes Danny to Franchise Euphoria. [3:11] Although Danny grew up in New York City surrounded by a brilliant food scene, it took him a trip to Israel to inspire him to create this food concept with his brother in law. [5:20] Danny built the restaurant in 2004 and did so without any prior restaurant experience. [7:10] What propelled Taboon into success was a review in the New York Times. [8:12] Taboon pioneered the “middle-teranean” concept which is a fusion of middle eastern and Mediterranean cuisine. Danny has now trademarked the concept to make it exclusive to their business. [9:33] Taboonette is a scaled-down version of Taboon, and the idea of making it a franchise concept appealed to Danny. [12:03] Danny found that franchising Taboonette was more intense than creating the original Taboon location just based on the level of detail involved in the process. [15:24] Danny credits his franchisor advisor with much of his success in being able to franchise his business. He strongly suggests having the proper team of people behind you throughout the process. [16:41] In the end, Danny believes franchising is about the success of your franchisees, so backing them with as much support as possible is key. [16:58] Taboonette is looking for franchisees who are passionate, have a strong attention to detail, some experience in the restaurant industry, and the ethics to stay involved in their community and give back. [18:55] Taboonette plans to grow within their centric circle so they can properly service all of their locations at the outset. [20:33] Danny explains that to franchise your business, you have to adapt a new mindset about your business in order to compact it into a turn-key model that is scalable. [22:57] If you want to learn more about Taboonette, visit their website www.Taboonette.com. [23:45] Thanks for listening, and please, reach out to Josh anytime through email at josh@franchiseeuphoria.com. If you enjoyed this interview, please leave us a review on iTunes.